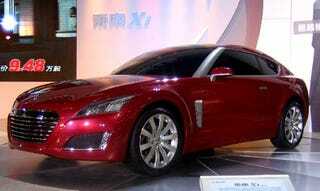 As with many western auto shows, the Beijing Motor Show has become obsessed with hybrid concept cars. Though most of these hybrids are sedans or MPV's, automaker Soueast decided to go with a squashed GT sports car. The result is the X1 Plug-in HEV, which looks rather sharp and manages to be almost a modern interpretation of a Jensen from certain angles. Does the powertrain exist? Maybe, maybe not. Does Jackie Chan endorse this car? Probably not. But Soueast makes cars in a deal with Mitsubishi Motors so they probably had a bunch of posters lying around and everyone loves Jackie Chan.